Mars has moved along rapidly in its orbit, while Earth stalled, and Mars thus rises too early, as it did for the Conjunction on Feb 25. This has been noted during Observations, and because of this focus, a keen eye noted on Mar 23 that a photo on SpaceWeather.COM for that date included Mars and did a close check. Mars is missing? No matter "et voila'" a brand new Mars! SpaceWeather.COM says, of this photo received from Quebec. PLANET PARTY: This is an extraordinary week for planet watching. 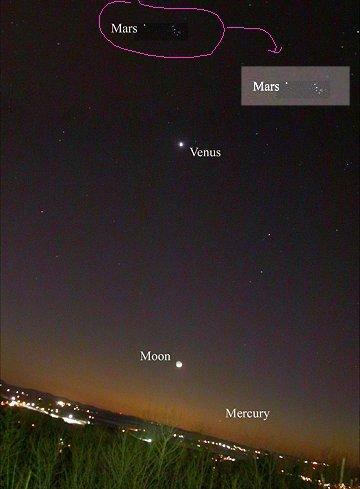 Step outside just after sunset and you can see Mercury, Venus, Mars, Saturn and Jupiter--no telescope required. Pay special attention on March 24th: the crescent moon and Venus will be pleasingly close together. 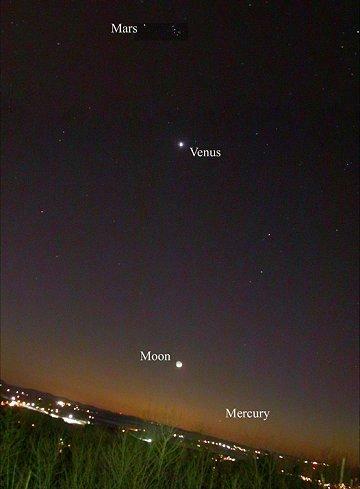 Last night, Rémi Boucher of Sherbrooke (Qc), Canada, took this picture of Mercury, the Moon, Venus and Mars. A larger version shows Saturn and Jupiter, too. Click on these links for the Small and Large versions, untouched as copied from NASA's SpaceWeather web site. The cut and paste is not obvious, unless contrast is adjusted to bring this forth.